So you have got this great video that you have stored on your iPad, and want to share it with everyone else at the office or at home. The thing is, your iPad’s display is not really that large, and it would be inconvenient for some folks to view the video you play upside down, not to mention them not being able to drink in all the visual details that was carefully shot beforehand. Apple has yet to create an iPad with a built-in projector, so what would your next step be? This is where the $99.95 iPad To Television Dock comes in to save the day. 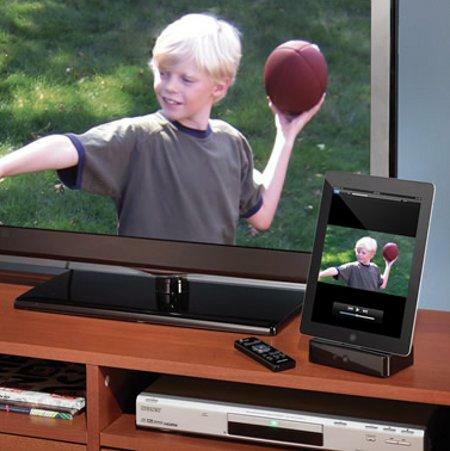 As its name suggests, the iPad To Television Dock is the ideal dock to play videos stored on an iPad, iPhone, or iPod touch – all on a connected TV. The dock itself will hook up to a TV thanks to the included composite cable, making it ideal for sharing recently captured footage, be it a holiday football game or day of skiing on the Swiss Alps. Apart from that, the iPad To Television Dock also doubles up as a charger, since your connected Apple devices will be recharged along the way. It will play nice with the iPad, iPhone 4, iPhone 3G/3GS, and iPod touch just in case you are interested. COMPOSITE cable?? It’s SD?? RU kidding me? Worthless!